You see it right! 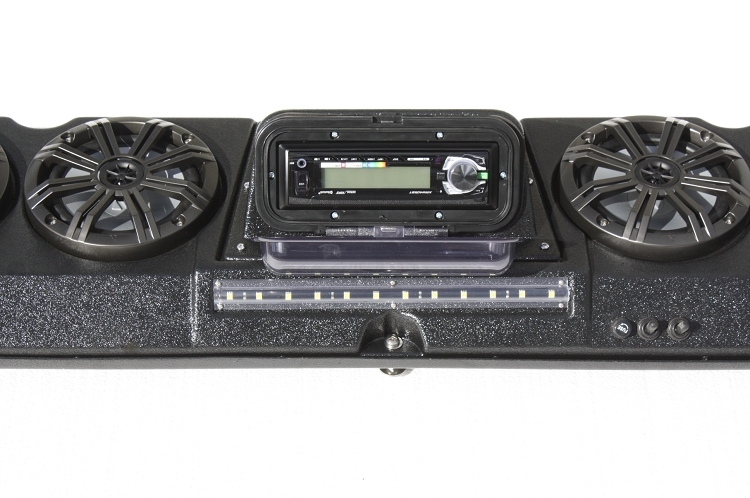 Yes 4 big 6.5" KICKER speakers in one slender unit that neatly fits just aft of the windshield on all new Polaris General UTV's. You get the ultimate "loud" sound quality in one package for one low price! And, It's Made In The USA! Ready to install and play, mounts easily with our comprehensive mounting kit designed to work in conjunction with the factory Polaris mounting plate. Only requires a constant 12 volt power source from your machines battery. You can be jamming to your favorite sounds in less than an hour! Quality molded in durable ABS, same as under the hood of your car and much of your General. Stylish design, not a box like others make. Designed with fit and finish to look as if it came from the factory. Low profile powered antenna if AM/FM is going to be used. RETURNS; we can charge up to a 15% retocking fee. A RMA is required.